The Cham Dance is a vibrant masked and costumed ritual with roots in Buddhism. Associated with the Tibetan Buddhism that prospered in the Great Himalayan Mountain Range, it is a religious tradition performed by monks. The ritual is performed for the greater good of humanity, destruction of bad spirits and for moral instruction to viewers. The dance ritual of Cham is till date practiced in Himalayas, especially in places where Tibetan Buddhism prospered in India- Ladakh, Dharamshala, Lahaul Valley, Spiti Valley & Sikkim, and Bhutan and Tibet. 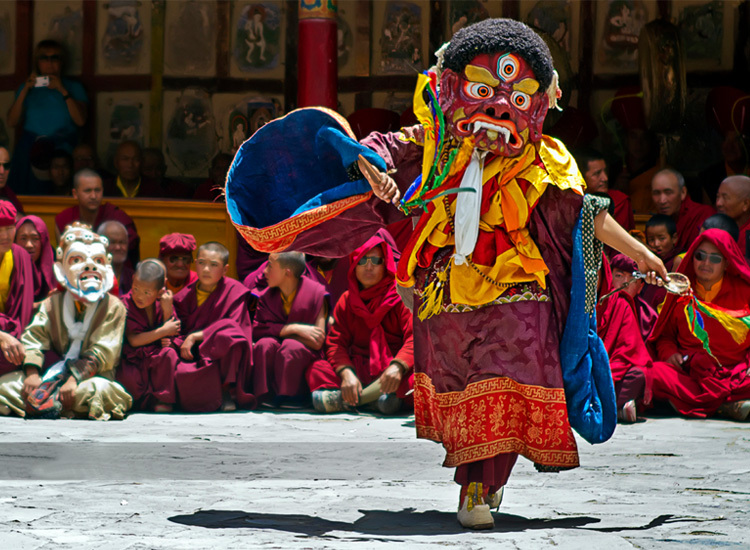 The dance is the highlight of Buddhist festivals and special events of the monasteries. A spellbinding show for all those who attend, if you are interested to know all about Cham Dance, keep on reading. The origin of Cham dance is not clearly known. Sharing its roots with Tantric mystic arts, Cham is said to have first originated in the Himalayan range and so is still date kept as a treasured secret in the lap of the mountains. According to a legend, the Cham dance tradition was started by Guru Padmasambhava in the late 8th CE. When the king of Tibet, Trishong Detsen called Guru Padmasambhava to get rid of evil spirits that did not allow to build the Samye monastery, the revered Guru performed the dance ritual. The same ritual over the period of time became the elaborate Cham Dance, a practice specific to the sect of Mahayana Buddhism. Considered as an act of cleansing of evil forces, Cham Dance is an elaborate masked and costumed dance. Before the performance, Gods and deities of Buddhism are evoked. In fact, even the dance is a ceremony inspired from tantric traditions that were performed for the greater good of all sentient beings. The religious significance of the Cham Dance is in performance itself. The tradition fits the monastic life as the dance is not focused on movements but on rituals of meditation, hand gestures, chants, invocation of the deities and the effect it has on destruction of negativity. Dressed up in vibrant colors with extravagant headgear and masks, the monks take up the roles of deities and demons and put up a mock-battle with good prevailing over evil. The Cham performance also acts as moral lessons for viewers, narrating tales about their legendary deities. The acts and the form of the masked dancers serves to familiarize devotees with the kind of deities they are to encounter during the 49-day- ‘Bardo’, the transition period between death and rebirth in one of the six forms of existence, depending upon one’s karmic existence. Where to see Cham Dance in India? Cham Dance in India is performed till date at the Buddhist monasteries mostly snuggled up in the Himalayas. Found in Ladakh, Sikkim and Tibetan settlements of Himachal Pradesh, the monasteries are home to monks that practice the Cham Dance ritual on their religious festivals. 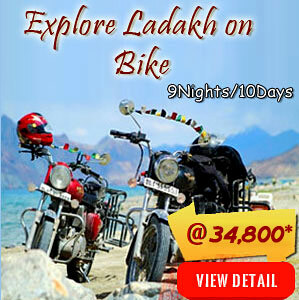 When you think of the best places to see Cham Dance in India, Ladakh tops the list. The region known as ‘Mini Tibet’ has ancient roots in Buddhism. The remote “Land of Passes’ in Jammu and Kashmir have some of the most popular places to attend the masked dance ritual. Hemis Monastery during the Hemis Festival, which is also known among the popular festivals in Ladakh to see Cham Dance. Ladakh Festival celebrated in Leh and surrounding villages is also one of the best events to watch Cham Dance in Ladakh. On the list of monasteries that still practice the ritual of Cham Dance in India, we just cannot miss to mention the North East part of India. The Sawak Dawa Festival held at Tsuk-La-Khang Monastery, Gangtok and the Kayged Festival, Old Ralang Monastery is one of the best events to watch Cham Dance in India. The celebrations of the Losar Festival, which is celebrated in all of the Buddhist Monasteries has a special event dedicated to Cham Dance. The Tibetan settlements in Himachal Pradesh- especially in Dharamshala, Lahaul & Spiti Valleys also perform the Cham Dance in the monasteries at their annual festivals. When to see Cham Dance? Moving on, the next question that arises in your mind is when to see Cham Dance in India. For that there is no particular season or event to watch the ritual. The ritual dance is performed at most of the monastic festivals. Each one of the monastery celebrates their own festival; held in summer, some in winters and many celebrate festivals according to the Tibetan Lunar calendar. There are a number of popular festivals in Ladakh that provides the ideal opportunity to watch the Cham Dance. The ritual dance-drama of ‘Cham’ is a highly choreographed event. A select group of resident lamas dressed in brightly patterned attire and masked gears perform as directed by the ‘Chham-spon’, the mystic dance master. All the lamas of the monastery dress up in their full ceremonial attire, recite the mantras associated with the ‘Chhams’ led by the Rimpoche, the highest in the order of monks of the monastery. The recitation creates the appropriate ambiance. The performance is not just a dramatization of the philosophy of ‘good over evil’ but also ritual offering to the deities of the monastery and the guardians of the faith. The masks worn in Cham represent various characters, which are mostly preserve all through the year in the form of statues in the “Gon Khang”, the room dedicated to the guardian divinities in each of the monasteries. The masks range from benign to fearsome forms that represent famous characters from historical episodes or Tibetan fables, powerful divinities in their various manifestations, mostly representing the Dharmapalas or protectors of the faith. Performed at the monastic courtyard around the central flagpole, the performers hold ritual instruments in hands and dance to the tunes of the monastic orchestra. The hand gestures of the dancers symbolize different aspects of the dance-drama. For comic relief in the somber sequences, performers jump into the scene in the guise of skeletons and other characters, performing comic and acrobatic feats. The Cham Dance often last from 2 days to over 15 days, right from invocation of deities to the commencement. As the ‘Chhams’ approaches its end, the climactic scene is enacted. A sacrificial offering, human figure made from dough, is ritually cut into pieces and scattered in the four cardinal directions. Accordingly, its destruction represents killing of the enemy of Buddhism and the purification of the human soul from the three evils of ignorance, jealousy and hatred. Cham Dance is an insight into the rich culture and heritage of Buddhism, get ready to attend a performance that you cherish forever. 2 comments on "All about Cham Dance : A Ritual Dance by Tibetan Monks"
Thank you for your kind words. For more interesting posts, keep following our blog.